Without doubt, there are very few men/boys and girls who at sometime in there life have not played or collected toy soldiers of some kind, whether it be toy soldiers in plastic or metal to Action men figures to Star War figures and figures of Fantasy from Warhammer and such companies. Over time the older figures from Victorian days through the War years up until this present day have suddenly become very collectable, the smaller scale figures have been used for wargaming and altogether the various types, countries and scales have been collected in miniature armies in the home, bringing nostalgic joy to their owners. 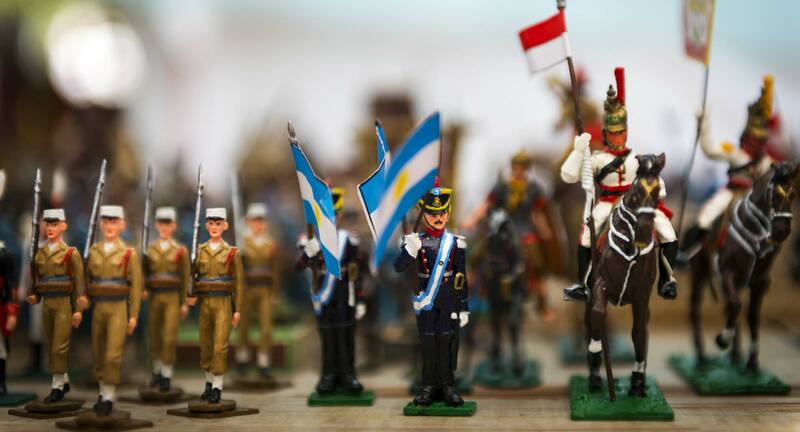 Nowadays collecting has become a serious business and huge values are put on some of the very rare toys and the auction rooms do very well when toy soldiers or model soldiers come under the hammer. Zinnfiguren or Flats have become more and more popular, they are small, easy to house and can be painted so the interest has grown and large armies can be amassed and put on display.All periods of history are covered making them a very collectable part of this interesting collectable field. The Lineol & Elastolin composition figures made from compressed sawdust and glue over a wire frame are superb figures, made as toys but with natural positions and movements that bring alive these super toy soldiers, they have fast become very collectable. The field is huge, plenty to choose from, and it makes for a very interesting hobby for all ages to collect.